We were asked last year by Silver Horse, a Native American ancestor spirit, if we could bless the major rivers as we were traveling and creating grid points for the Earth Healing Grid. So we developed a method to charge up crystals with energies of higher consciousness and healing, using ceremony and the SCIO/EPFX device. When these crystals are put into the waters the energy is released, spreading both downstream and upstream, healing everything and everyone it touches. Silver Horse taught us how to communicate with the river spirits, most of whom we have found to be amazingly conscious and very powerful. They are in charge of thousands of water elementals along their waterways. 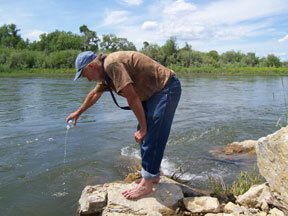 "Waters are so sacred and I am so glad that you really understand this, very few others do. The waters are the blood of the land and without caring for them, if they get clogged, or polluted, or tampered with in any way that prevents them from carrying their energy throughout the land, it is like when you have trouble with your own blood vessels in your body. The energy does not flow and therefore health does not ensue. Contact us and we will send you a package of crystals and instructions. Our goal is to eventually bless every major river in the world. We keep track of the crystal locations and recharge them regularly, and they release the energies to the water each time. This is an ongoing healing. We only ask for a small donation to pay for our expenses and shipping. We are all volunteering our time because we love this beloved planet. This is a very fulfilling way to make a difference, and fun too! Donate now online to get your package.